Medical peer-review journal for practitioners and researchers. Indexing: Russian Science Citation Index, BIOSIS Previews, EBSCO, DOAJ, Google Scholar, Ulrich's Periodical directory. 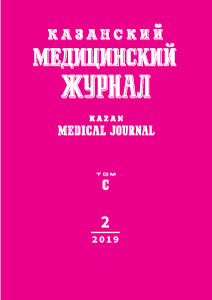 Kazan Medical Journal is a peer-reviewed journal for clinicians and medical scientists, practicing physicians, researchers, teachers and students of medical schools, interns, residents and PhD students interested in perspective trends in Russian and international medicine. Missions of the Journal are to spread the achievements of Russian and international biomedical sciences, to present up-to-date clinical recommendations, to provide a platform for a scientific discussion, experience sharing and publication of original researches in clinical and fundamental medicine. Bozhko Y.G., Arkhipov M.V., Belokonova N.A., Kiseleva D.V. Zalova T.B., Polupanov A.G., Tsoy L.G., Rysmatova F.T., Sabirov I.S. Solodukhin A.V., Trubnikova O.A., Seryy A.V., Yanitskiy M.S., Barbarash O.L. Bril’ E.A., Moiseenko S.A., Galonskiy V.G., Shishkov N.Y., Pustoshilova A.S., Bril’ V.I. Dubinets I.D., Sinitsky A.I., Korkmazov M.Y., Chernykh E.I., Kukhtik S.Y. Mekhtieva S.A., Nasirova S.R., Rakhimova N.D., Gafarov I.A. Vashchenko L.N., Gudtskova T.N., Nepomnyashchaya E.M., Karnaukhov N.S., Kvarchiya M.V. Dunaev P.D., Galembikova A.R., Boichuk S.V. Lycheva N.A., Sedov A.V., Makushkina D.A., Shakhmatov I.I., Vdovin V.M. Vdovin V.M., Momot A.P., Orekhov D.A., Tolstokorov I.G., Shevchenko V.O., Krasyukova V.O., Shakhmatov I.I., Lycheva N.A., Belozerskaya G.G. Yakovleva O.V., Glukhova T.N., Rogozhina I.E. Kraevaya E.E., Petrosyan Y.A., Tapil'skaya N.I. Chzhen T.R., Kiseleva T.P., Torosyan M.R. Sazanov G.V., Belokon’ O.S., Krasnov A.Y. Pinchuk A.V., Anisimov Y.A., Dmitriev I.V., Storozhev R.V., Balkarov A.G., Muslimov R.S., Khodilina I.V. Garanin A.A., Osadchuk A.M., Adyshirin-Zade E.E. Onnitsev I.E., Bugaev S.A., Ivanusa S.Y., Dzidzava I.I., Khokhlov A.V., Kotiv B.N. Omelyanenko A.S., Mavlyudov T.I., Sapelnikov O.V., Cherkashin D.I., Islamova I.M., Nasibullina A.R. Izmaylov S.G., Ryabkov M.G., Leont’ev A.E., Beschastnov V.V., Izmaylov A.G., Lukoyanychev E.E. Abdulganieva D.I., Kirillova E.R., Bombina L.K., Khusainova A.K., Bol'shakov N.A., Sabirova G.S. Ksembaev S.S., Torgashova O.E., Ivanov O.A.